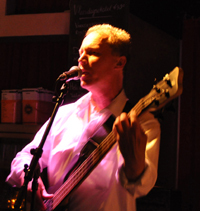 Jack Monck (bass guitar, vocals) started out in 1968 playing with Stephen/ Phil Miller and Pip Pyle in Delivery, touring the UK and backing visiting American blues artists such as Otis Spann and Champion Jack Dupree. In the early 1970’s Jack worked in Cambridge with Syd Barrett, Fred Frith and Chris Cutler, also with Jon Owen (Global Village Trucking Company) and Mike Khan, and in London with Geoff Leigh in Radar Favourites. He had started writing his own songs in the mid 70’s, some of which were released on ’Inside the Whale’ (Voiceprint CD) in 2001. 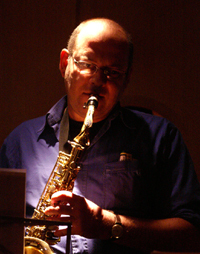 He started “That Uncertain Feeling” in 1985 (later the Chan/Monck Group with Marc Hadley) and co-formed the Relatives in 1988, at this time playing mainly on the East London jazz scene. In 1993 he re-connected with Geoff Leigh in The Highly Irregulars, recruited Moroccan percussionist Lahcen Lahbib, and in 1996 formed Momo with whom he gigged extensively until 2001, recording the 1998 CD “Music4Senses”. In 1999 Jack completed a Music Facilitator course and started teaching bass guitar at Colchester Institute where he remains today. 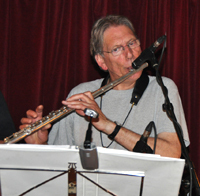 Marc Hadley (saxophone & flute) started playing saxophone in a band with schoolfriends in 1972, influenced by the alto sound of Elton Dean. In 1984, he met Jack Monck in London while playing with a West African band with musicians associated with Fela Kuti...In 1986, he moved to Paris and there met Tenor sax legend Dexter Gordon- a profound influence on subsequent direction..In 1987, after a spell in Los Angeles, he returned to London to take a diploma in Jazz at the Guildhall School of Music, where he studied under Don Rendell, Jean Toussaint, Ian Carr, Trevor Tomkins and John Harle. His subsequent career in London included studio session work for various record labels, ad agencies and TV production companies.... joined the Relatives in 1989, and also spent eight years with Brazilian band Viramundo. In 1998 he opened at the Montreux Jazz Festival for Van Morrison and the Ray Charles Orchestra. After moving to Cornwall in 2004 he worked with the Knee High Theatre Company and at The Eden Project; and featured as a soloist on “8 am”, the acclaimed 2008 release by Kris Gayle (see Damian Rodd’s biog.) In 2010 he was appointed associate lecturer in Music performance at Dartington College of Arts (now Falmouth University), and is currently taking a Master’s degree in Ethnomusicology at SOAS, London University. 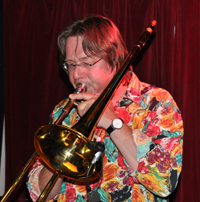 He has made regular appearances at St Ives Jazz Club and has also backed John Etheridge and Pete Churchill. 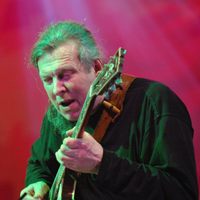 Phil Miller (guitar) A self-taught musician, he had his first guitar aged 8 and his first band was Delivery, formed in 1966. It included his brother Steve on piano and a childhood friend, Pip Pyle on drums along with Jack Monck on bass. Later on they were joined by Jazz saxophonist Lol Coxhill, a friend of Steve’s from the London blues scene. Jack Monck was replaced by Roy Babbington in 1969 and with the addition of singer Carol Grimes they recorded the album ‘Fool’s Meeting’ in 1970. Phil’s own writing career started at this time. A close friend then recommended him to Robert Wyatt who was in the process of forming his own band Matching Mole after leaving The Soft Machine. He joined alongside Dave Sinclair (organ) from Caravan and Bill MacCormick (bass). They recorded two albums for CBS and toured opposite Soft Machine in Holland and France and John Mayall in the UK. In the summer of 1972 he began rehearsing with Richard Sinclair (who had just left Caravan) and Pip Pyle, back from his stint with Gong in France. This band settled down early in 1973 with Dave Stewart on keyboards and became Hatfield and the North. During its two-year existence Hatfield recorded two albums for Virgin Records. His next band, National Health, was an idea born in the minds of keyboardists Dave Stewart and Alan Gowen following two double-quartet gigs by Hatfield and Gilgamesh in 1973. National Health split in 1980, and Phil formed In Cahoots in 1982: this has been the vehicle for his compositional output throughout its various line-ups ever since, and has generated nine albums; most recently, “Conspiracy Theory” in 2007, and “Mind over Matter” in 2012. In 2010 Phil guested on The Relatives mini-tour in Holland, and in 2012 began to contribute to studio tracks for their next album with a view to joining the band to play live when all the “hows’’ and ‘whens’ fall into place. Pjotr playes the flute since the age of 16 in. His first band was the symphonic rockband Crusade . Then he also started playing the different saxophones and became member of the commercial band Exclusive in which he did a lot of gigs. In that period he also played in several bands with WillemJan Droog. He participated on 2 CDs of tangosinger Mabel Gonzales.Now Pjotr has in own band Demeter and plays in the big band Enterprise and in the Melle band. 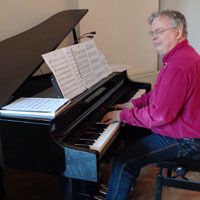 Kees Meijlink was member of all the different Relatives settings since the beginning in 1990. He plays the guitar, electric & double bass, tuba and the trombone in the Relatives . He played with WillemJan and Henk Weltevreden in Slipover and after that period in lots of different bands doing blues, pop jazz & salsa. He is a musical omnivore. He participated in the XL Jazz Orchestra with the Zappa project Jazz from Hell with leader Martin Fondse (CD Zappa XL). 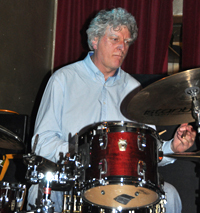 Drummer Mels Bol started playing in 1968 as a member of the Rotterdam band “Crusade” with a.o. Pjotr Jurtschenko. After that he became member of Cuby’s “Red White and Blue” in 1975 renamed Cuby and the Blizzards, in which he played with the legendary Herman Brood. After the bluesperiod Mels started playing Jazz and and played in the Rotterdam Jazz Project As a free-lance drummer Mels played in lots of commercial bands, jazz & bluesbands. With the Bill Bakers Bigband, he toured in England and the U.S.A. Mels is now doing his own project the “Melle Band ”, in which he composes and writes lyrics.